Sometimes you need to close/exit your application without using hardware if any exception occurs. In this tutorial, you will learn to close/exit your android application programmatically. While closing your application when any exception occurs it is better to show an error message at first and exit your application. Following code shows you to close/exit your running android application. Following is the content of java activity file and XML layout File. This is XML content of android layout file where I have added a button and add onClick attribute. 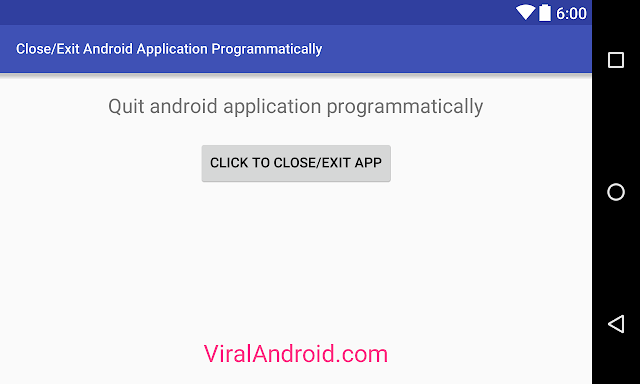 Now, run your How to Close/Exit Android Application Programmatically application and click the Click to Close/Exit App button, your application will be closed.